What Has NAFTA Meant For Workers? That Debate's Still Raging Two decades ago, labor unions warned that the North American Free Trade Agreement would drive away U.S. jobs and push wages down. Today, unions feel as strongly as ever that NAFTA was a mistake for U.S. workers, but quantifying the factors behind the decline in the middle class is no simple matter. 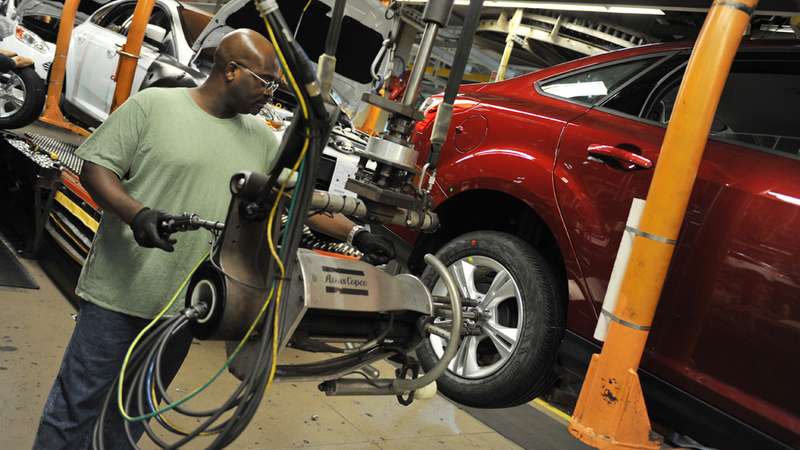 An auto worker tightens bolts on a Focus at a Ford plant in Michigan in October. Labor unions predicted in 1993 that NAFTA would send many U.S. manufacturing jobs to Mexico, and they continue to argue that the pact prompted a race to the bottom for workers. Two decades ago, the strongest critics of the North American Free Trade Agreement were members of labor unions. They warned that the trade deal would mean the loss of manufacturing jobs to Mexico and lower wages for U.S. workers. Today, 20 years since NAFTA's passage, unions feel as strongly as ever that the deal was a bad idea. Back in 1993, the labor movement was mobilized against the creation of a massive free-trade zone including the U.S., Canada and Mexico. There were union-backed protests around the U.S. — at the Capitol in Washington and especially in the industrial Midwest and in big manufacturing states. That fall in Lansing, Mich., Ruben Burks of the United Auto Workers addressed a big crowd. "Do we care about our jobs?" he said to cheers. "Do we care about our brothers and sisters in Mexico and Canada? Brothers and sisters, we're going to stop this NAFTA — you're darn right we are." Except they didn't. President Clinton was in his first year in the White House, having been elected with help from traditional Democrats — including union members. But he disagreed with labor on NAFTA. Unions predicted disaster for U.S. workers: a flood of high-wage American factory jobs moving to Mexico. In a radio address that fall, Clinton spoke to that worry. "Well, if we don't pass NAFTA, that could still be true. The lower wages and the lower cost of production will still be there," he said. "But if we do pass it, it means dramatically increased sales of American products made right here in America." So during the NAFTA debate, labor unions squared off against a Democratic president. That wasn't necessarily a rare thing, but Harley Shaiken, a labor analyst at the University of California, Berkeley, notes that the reach of the controversy made it unusual. "Trade debates from World War II up to NAFTA tended to be rather sedate. Important issues, but left to the experts," Shaiken says. But NAFTA, he says, "put the debate onto Main Street, into union halls, into community groups as well as into Congress." And since NAFTA, trade has regularly been a contentious topic, prompting debate and protests. "Globalization" has become a term both praised and scorned. Still, quantifying NAFTA's impact is nearly impossible. There are many reasons for job losses. Some parts of the U.S. have been winners and others losers. The number of manufacturing jobs has declined significantly in the past two decades, especially in places like Michigan, Ohio and Indiana. Ask Bob King, the UAW's current president, about NAFTA at 20 and you'll get a blunt answer. "It's been a disaster to me," he says. "Unions like the UAW, like the steelworkers, like the Teamsters, were really undermined in our collective bargaining power by NAFTA," he says. "Because now, we go in and we bargain with [car] parts supplier companies and they say, 'Well, we can go to Mexico and make this cheaper.' "
"We are not growing good, middle-class jobs in America," he says. "I'd like to know, where are the jobs? What are they talking about, Wal-Mart? They're talking about all these temporary, part-time jobs?" The UAW is only about one-half the size it was two decades ago. Again, that can't all be attributed to NAFTA. General Motors and Chrysler both went through bankruptcy and survived, but are now much smaller. And the share of the car and truck market that U.S. car companies command is down, as well. In Mexico, the auto industry has boomed. "Since NAFTA was enacted, it's been replicated in other trade agreements that the U.S. has signed throughout the world," labor analyst Shaiken says. "And it's that broader expansion of the NAFTA model that has absolutely put a pressure on manufacturing employment and has been a factor on manufacturing wages being either stagnant or declining in so many industries." Labor unions argue that NAFTA promotes a race to the bottom. NAFTA advocates say its impact has been overwhelmingly positive. The disagreement is as pronounced as it was 20 years ago.